This morning I discovered a second story of mine is out in the world! (Three more are forthcoming.) 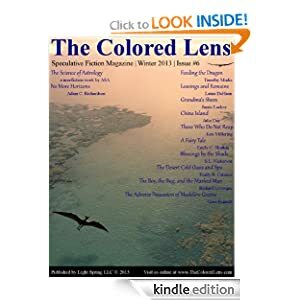 The Colored Lens, an emag, published “China Island.” I wrote it before I started my M.F.A. program. In fact it’s one of the things that got me in. Anyway…It’s set on a Maine island in winter. Creepy, melancholy and worrisome are all good descriptors. The ending is likely as close as I get to the classic happy ending. (Warning: it’s not terribly close.) If you’re interested in a read, you can find it at Amazon.com. It’s even free for Amazon Prime subscribers. My writing friend and comrade-in-arms, Angela Still, included me in her Next Big Thing post! Angela and I share our weekly writing goals each week, and even better, make sure the pressure isn’t getting either of us down. Plus the woman has the best tattoo I have ever seen: a single peacock feather than runs diagonally across her back.